Malaysian police have said a blast at a bar last week, which injured eight, was the first attack by the so-called Islamic State group in the country. 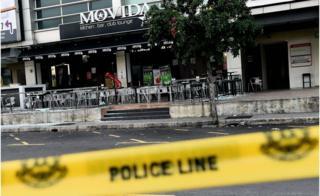 Police initially said that business rivalry was a more likely motive for the attack on the Movida bar restaurant outside Kuala Lumpur on 28 June. They added that two men suspected of involvement had been arrested. Authorities are increasingly concerned about IS-related attacks as a number of Malaysians have gone to fight in Syria. "There were elements of IS involvement in the attack," national police chief Khalid Abu Bakar told reporters. "We found out that the two of them received instructions from one of our own citizens in Syria... to conduct attacks in Malaysia." There have been dozens of extremism-related arrests in recent years, including 13 Malaysians detained following the latest attack but who police said were not directly connected to it. Governments across the region have warned of an increased threat from the group.